CBC is in the top spot in Vancouver with more than a 5% share ahead of the number 2 station. The CBC with a 14.2 share is the only station to make it into double digits this time around. Slipping to #2 and dropping a massive 4 share is Bell’s CIQM. I wonder if this is a PPM wobble given they have averaged a 12.2 share over the previous 5 ratings periods. The Corus news station (CKNW) is down in share but hangs onto the #3 slot. Corus would be celebrating as sister station CFMI-FM (Rock 101) is up a spot to #4 and grew audience by 1.1 share points. Bell’s Virgin Radio (CKBT-FM) is static but slipped to #5. At #6 is JRFM the country station which enjoyed decent growth (5.3 to 6.8). Newcap’s Z95.3 (CKZZ-FM) was static at 5.5 but slipped back to #7. The other Corus rocker, CFOX grow audience as well and made it into #8. Overall, 9 stations increased audience share, 7 slipped and 4 stayed the same. CHFI took a big drop in this book, but manages to hang onto the top spot. One has to wonder if the change in morning show has had an impact. The CBC also took a dive in the ratings they hold onto the #2 position. Toronto is a single digit market for the first time in several books. Newcap’s Boom 97.3 (CHBM) is the station on the move and is up to #3. This station is fun to listen to, has great imaging and they are doing things that other Toronto stations appear to have given up doing, such as putting lots of listeners on the air. They are doing things differently and clearly are being noticed. CHUM-FM lost audience share, and dropped to 4th. Sister station CFRB is the big mover this time around, and are up 5 slots from #10 and growing from a 3.5 back to a 7.0 so perhaps the PPM ratings gods were unfair to this station the last time around. The other news station CFTR 680 news also benefited from all the things happening in the world, but are down one slot to #6. Virgin radio increased audience share but dropped one slot to #7. Other stations losing audience and ranking included CFMZ (Classical 96.3) who drop from 7th to 11th, and CNFY who grew audience share, but dropped from 11th to 13th. The Fan 590 (CJSL) also had a decent book jumping 2 slots to make it into #12. Indie 88 got a nice positive bump moving from 2.0 to 2.6 which is their best book ever. Overall 11 stations increased audience share, 8 slipped and 6 stayed the same. Bell’s CJAD keeps its hold on the #1 spot. Positions 4, 5 and 6 remain static with Bell’s CHOM-FM, the CBC and TSN holding those positions. Cogeco’s Rhythm 105.7 (CFGL-FM) has moved from 10th place to 7th over CJPX-FM (Radio Classique), CBM-FM and CKOI-FM. Overall, 3 stations in this market increased their share while 5 slipped and 10 retained their previous ranks. 102.3 NOW! (CKNO-FM) is still #1 and improved its lead over the competition again and now a full 3 share points ahead of the #2 station which is CISN-FM (Corus) who jumped from #5. The sister talk station to CISN is the Corus owned 630 CHED and while they dropped some listeners and a position to ranked 3rd in the Edmonton market. The CBC is static in 4th place. Newcap’s Capital 96.3 (CKRA) dropped 2 slots and over a share point to take out the 5th slot. Their sister station K-Rock (CIRK-FM) picked up some listeners but remain in the 6th spot. In 7th spot is the other Newcap station CFCW the AM country station. The Bear (CFBR-FM) stays in #8 with 91.7 The Bounce (CHBN) rounding out 9th. Overall, there were 5 stations improving market share, 5 stations in Calgary losing audience and 9 remaining static. Newcap’s XL 103 FM (CFXL-FM) is back in the top slot in Cow town. At #2 is the Corus news station (CHQR) @ 770 on the AM dial picked up a position. Slipping 3 places is Country 95 (CKRY-FM). The CBC is also static and stays at #4. X92.9 the Alternative station owned by Harvard and programmed by the very smart Christian Hall is up 3 spots to #8. In at #5 is the Bell Rocker CJAY who are up 4 spots from #10 last time out. This seems to be at the expense of the Corus rocker Q107 (CFGQ) who lost audience share and dropped a spot to #7. The Rogers station, Kiss 95.9 (CHFM), slipped to #8 just beating sister station Jack FM (CJAQ) that looks to be struggling. Overall, there were 4 stations improving market share, 5 stations in Calgary losing audience and 9 remaining static. 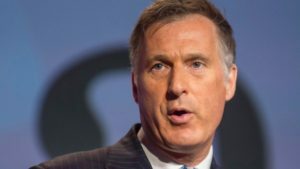 The CRTC has discouraged competition in the telecommunications sector and should have a far diminished authority over the industry, Conservative leadership candidate Maxime Bernier said Tuesday. The CRTC has stifled competition with some of its decisions, he said, citing as an example the regulator’s ruling last year that requires major Internet service providers to sell space on their high-speed infrastructure to smaller rivals at wholesale prices. That decision was endorsed last month by the federal Liberal cabinet. Bernier, a former industry minister who once oversaw the CRTC, also slammed the regulator’s recent public consultations on broadband Internet services in Canada, calling them a waste of time and money. The CRTC said it had no comment on Bernier’s position. Bernier said the CRTC’s role as telecom regulator should be phased out over the next two or four years and that the federal Department of Innovation, Science and Economic Development take over its remaining essential functions, such as 911 services, while the Competition Bureau oversee competition issues. He said he plans to outline what he believes the CRTC’s role should be as it relates to broadcast services later this year. He also expressed his opposition to the setting aside of a portion of wireless spectrum to new entrants at spectrum auctions. He said it would be better to open that up to foreign investment. BCE’s friendly deal announced last month to take over Manitoba Telecom Services also garnered Bernier’s support. The acquisition requires approval from the Competition Bureau. Bernier has repeatedly spoken out about the need to deregulate the telecom industry. There is an old story about the Jaguar sales person who lost a sale to rocker ‘Rompin Ronnie Hawkins’ because he pre-qualified him. The successful rockabilly singer did not want for cash, but didn’t look like a typical Jaguar customer when he entered the Toronto dealership with his long hair, a beard, and tattered jeans. The legend goes that when Ronnie seated himself in a Jaguar on the showroom floor, a jaded sales person asked him to leave. Every seasoned sales person knows the pain of losing a sale in their rookie days because they disqualified or pre-unqualified a prospect who later bought from a competitor. Advertisers who restrict their reach to pre-qualified targets are also missing sales. New technologies and alleged ‘big data’ have made reaching the masses via broadcasting or other mass media, dirty words in some circles. Advertisers are being lured by the ability to narrowcast and to finely target their marketing. The market is not narrowly defined by geography, especially for big-ticket purchases. RV dealers know that customers will drive hundreds of miles to capture the motorhome they want. And a consumer who lives on one side of a market often works and shops on the other side of the market. ‘Targeting’ end-users, buyers or decision-makers, ignores the role key influencers play in buying decisions. Millennials often ask the advice of their more experienced parents, and car dealers will tell you that husbands might sign the check, but they won’t do so without consulting their wives. The market, and people, changes rapidly. New jobs, increases or decreases in incomes, changes in marital situations and many other factors can turn an unqualified prospect into a qualified prospect overnight. In fact, the average market population with deaths, divorces, career moves, marriages and births, turns over at the rate of 20% per annum. Preaching to the converted will help advertisers maintain their customer base and today’s sales, but there will always be a certain amount of attrition that must be replaced. Reaching beyond their current ‘target’ is where their longer term growth will come from. In my own marketing, I publish a free weekly tip targeted at broadcast sales managers, called Ens on Sales, but I welcome broadcast account executives as well, because many of them who subscribed several years ago are now sales managers. Let’s not let advertisers be blinded by the light of shiny new things, and sell them on the merits of reaching beyond those who are allegedly unqualified today, to reaching everyone who might be qualified tomorrow.